← The Day Has Arrived! The first challenge was so much fun I’ve decided to participate in the Atlantic Hearts Sketch Challenge for a second time! It was an honor and surprise to be picked in their top 3 for my first entry!!! I started with White Daisy Cardstock for the base, and added an overlay cut with the new Artbooking Cricut® Cartridge in White Daisy Cardstock. I also used a Texture Tool and blotted Champagne Exclusive Ink® behind the overlay. Then I started with my center image. First with paper from the Chantilly Paper Packet, adding a layer of Kraft Cardstock, then another piece of White Daisy Cardstock. I used the Universal Backgrounds stamp set in Champagne Exclusive Ink® to create the wood paneling look. The flower is cut using the Artiste Cricut® Cartridge and the Hello Blooms stamp set in Ruby Exclusive Ink® (my new favorite color!!). I cut four flowers, layered them on top of each other, and curled the edges as I adhered them. I added a white embroidery floss* bow and a glitter button* to the center of the flower. 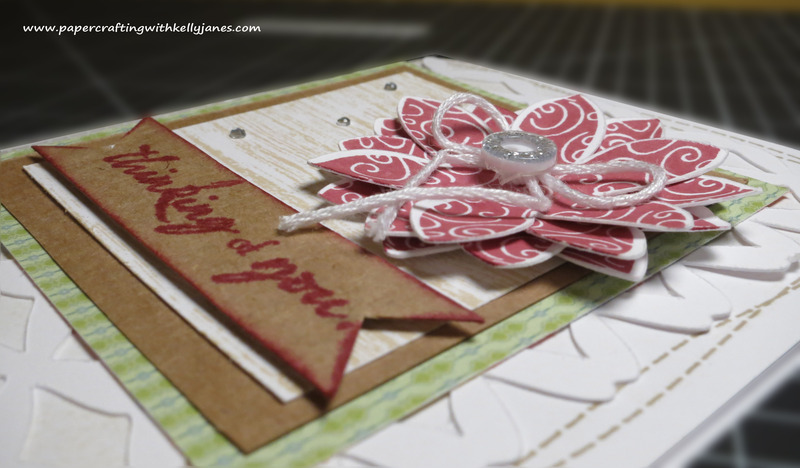 The sentiment is from the Card Chatter- Sympathy stamp set in Ruby Exclusive Ink® on Kraft Cardstock. I cut the banner shape using scissors and daubered Ruby Exclusive Ink® around the edges. I also added 3D Foam Tape to give the banner some dimension. I liked the bling the glitter button added to the card and decided to add some Bitty Sparkles also. Finally I added faux stitching using the Stitched Together stamp set in Desert Sand Exclusive Ink®. This card is linked to the Atlantic Hearts Sketch Challenge. Head over and check it out!!! It’s beautiful. The flower kind of reminds me of a poinsettia with that color. You really made the sketch your own. What a lovely blossom you created and I adore the embellishments you added 🙂 Thanks so much for playing along with us at Atlantic Hearts Sketch Challenge, please come back and join us again soon!!! Another great entry from you! Thank you for playing along with us at AHSC, and I really like the bling added to the card…..bling makes every thing fabulous! Thanks, Michelle! Bling does make everything fabulous!!!!! I try to use it when possible…having a boy makes it a challenge for my scrapbook pages, but there is no holding back when it comes to cardmaking!!!! 🙂 Thanks, again!!! Congratulations for being picked as one of the top 3 for last week! This is a lovely card and I am so jealous that you have found the time to play with Artbooking. Thank you for playing along with us at AHSC. Thank you, Candra! I LOVE the Artbooking cartridge! I just recently discovered the Cricut Craft Room and it works so great for the overlay feature that the cartridge offers!!! It’s so much fun!!! Very nice card. Like your faux stitching and overlay. Thanks for joining us at AHSC for this challenge. whoo hoo. my type of card. Love it. Thanks for joining us at AHSC this week. What a pretty card! I love all the artbooking elements! I love all the layers! everything works perfectly together! Very pretty card Kelly! Congratulations on your top three pick and good luck for this week’s challenge! Thanks for joining us at AHSC! Your card is wonderful. I love the background paper. Thank you for playing along with us at AHSC. Lovely card. The overlays are awesome on Artbooking! Thanks for playing at AHSC. Thank you, Krista! The overlays are awesome on Artbooking! It’s quickly becoming my favorite cartridge! CTMH’s cartridges just keep getting better and better!! I’m excited to see what they will come up with next!